Previous Prev The Big 4-0 is Here! Next Merce- Original HIV Comedy Series! Six months later, Stephen was dead. And I was in NYC for a funeral. I was heartbroken. One of the first openly HIV positive people I met, Stephen Gendin offered me a job at his HIV prescription mail order service, prompting a short-lived (uh, 3 weeks I believe) move to NYC that made me realize for the first time in my life that I was operating on very low levels of energy thanks to HIV. It was a tough pill to swallow. One night, as I told my boss and friend that I was packing my bags and heading back to Virginia to focus on my blog and sleeping schedule, he told me there was another way. He asked if I ever thought about starting on HIV medications. Stephen’s hope for survival rested in the advent of new medications. He was a longtime activist, the get-in-the-street and get arrested kind, the kind that are embedded in the AIDS community’s history and identity as being responsible letting drug companies and the feds know that people were dying. He’d signed up for drug trials, used his own body to further research, and was always looking for the next miracle drug. As we sat on the steps of the old Poz office in the West Village that night in 1996 one of us was hopeful, the other scared shitless about all these new medications. In the field of hemophilia treatment, miracle drugs were the reason why I had hep B, C and HIV. The reason why I was tucking tail as the going got tough. I didn’t make a big deal about how I became infected, and looking back I don’t think I could articulate my fears about the HIV medications even as I was showing the first signs that I needed them. To his credit, Stephen kindly accepted my resignation and refusal to give the pills a try. He was deeply confused why a 21-year old would choose to return to small town Virginia when he could start meds, get some energy, and pursue a new life in the city. But he was a friend, he said his peace and let me go in peace- it was a beautiful moment I’ll never forget, probably the defining moment of our friendship. 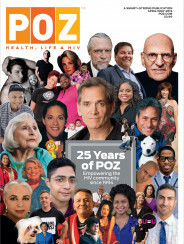 Most of my memories of Stephen are at Poz, which he helped found, or at his former company Community Prescription Service- the entire staff comprised of people living with HIV. I recall tooling around together at a few Poz Life Expos (where the picture above was taken) and I’m glad I kept in touch with him after I left NYC, embarrassed by my lack of staying power at the job he’d so kindly presented to me. In 1999 when I decided to start medications after my failing health left me with no alternative, I let Stephen know, and he never said or implied that he told me so. He just told me how happy he was for me on all fronts, most excited of which was the fact that my new girlfriend, Gwenn, had recently moved in with me. Looking back, I envied Stephen’s easy style, and was honored by his friendship and how he showed me that HIV--and people living with it--could be cool as hell. I miss ya buddy, a few years was not enough to know you, but I’m glad I got them. You were, and will always be, a huge influence on this little positoid’s life. To learn more about Stephen Gendin, check out Poz Magazine’s October 2000 memorial issue of the magazine in Stephen’s honor. Also, check out photos from the 10-year memorial gathering in his honor.